Size: Finished art is roughly 19" x 10". Calligraphy space is 14" wide. A writ in the East is a form of summons. It's a letter from the King and Queen requiring one of their subjects to appear at a future time and place for a specific purpose, in this case, to be indicted into the Order of the Pelican. Normally, a writ is a "simple" calligraphed letter with no paint to it. So why does this one look like a full-on award scroll? Rowen explained it thusly: "Mistress Honig, the illuminator, has been a good friend for years, since before she had a Maunche. They'd apparently assigned my peerage scroll and she didn't know, so she and Mistress Anastasia, one of my fairy god-peers, put this Writ together, along with Lord Alexandre, the calligrapher (who I've also known for a while). Honig said that since it was likely the only scroll she'd have a chance to make me, that I deserved the whole treatment." One of the great joys of being a scribe is being able to make pretty things for your friends. Sometimes, that may mean pulling out all the stops because of what that person means to you. As sometimes happens, this assignment was a rush. Honig had very little time to complete it, and as you can see, she had a lot of gold and paint to apply. She first contacted me at 10:16am on a Sunday asking if I could rush some calligraphy for her, at that point she already had the wording from Anastasia. 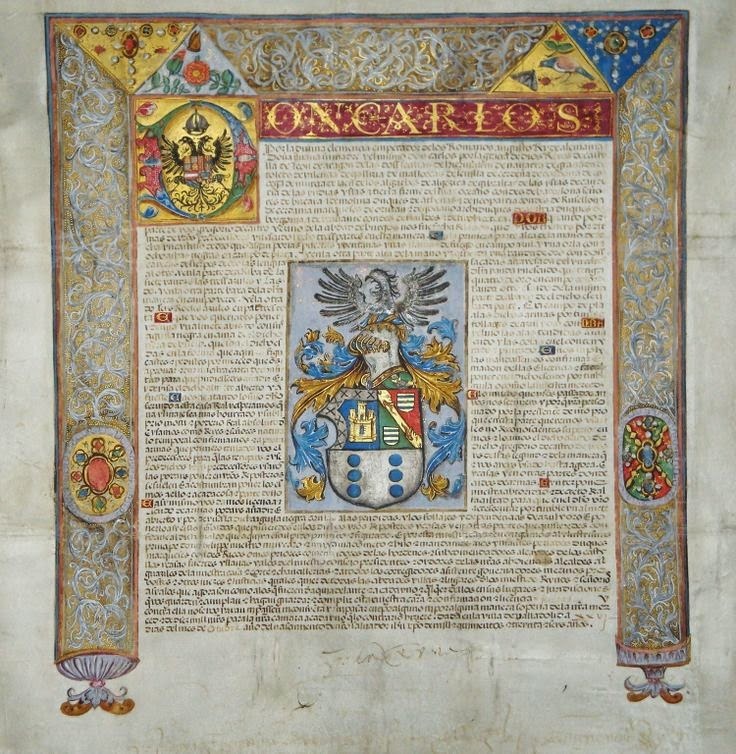 We went back and forth on some details and by 2:26pm we had decided to use this Grant of Arms to Gregorio de Castro as inspiration. In order to have Rowen's name painted in inch-high golden letters, we changed the proportions and made the text area 14" wide. That meant a final width of the artwork at 18", meaning I needed paper at least 20" wide to account for matting and framing. Luckily, I had a large enough sheet of watercolor paper lying around. I immediately got to work and finished the calligraphy 8:30pm that same night. I dropped it off to Honig the next morning before I went to work for the day, 22 hours after she contacted me. To be fair, I was already planning on working on calligraphy projects that Sunday, so I just changed which project I was going to work on. Examining the original, I decided the script looked like an Italian Rotunda. As David Harris explains in his Art of Calligraphy, Rotunda was developed in Italy in contrast to the rise of gothic scripts in the rest of Europe by being a legible and rounded formal hand. The roundness helps hide any inconsistencies in spacing that are so visible in the more rigid gothic. Because of the open bottomed design to the painted area, I didn't have to worry about fitting the words into a specific height. I picked a size nib that felt right given the overall size of the document, and got started. I measured the original script as I detail in how to copy a period hand. It appeared to be about 4 nib widths in height, so I grabbed a Hiro Rond #5 and made some reference strokes. It measured to #7 on the 1:1 scale of the AMES Guide. After drawing some lines on a test sheet, I wrote out one word to see if I felt that I had the line height correct, then created a reference alphabet. I also tested adding the "Order of the Pelican" phrase with the #3.5 nib to insure it would fit within the tight 1:1 line spacing. The above was the extent of my practice. I pounced the paper with gum sandarac, drew in the guidelines, and went to work. I'm quite happy with how this came out. The Iron Gall ink left very crisp hairlines and stroke edges, as well as some subtle variations in the depth of color of the letters. The Rotunda script was wonderful to write, and I really enjoyed how legible the result is. I usually write in gothic or Batardé, so it was interesting to play with curved strokes for a change. As always, I can find details to pick on... My spacing between words is maybe a little too wide, and not as consistent as I'd like it to be. Overall, I'm very happy with it. 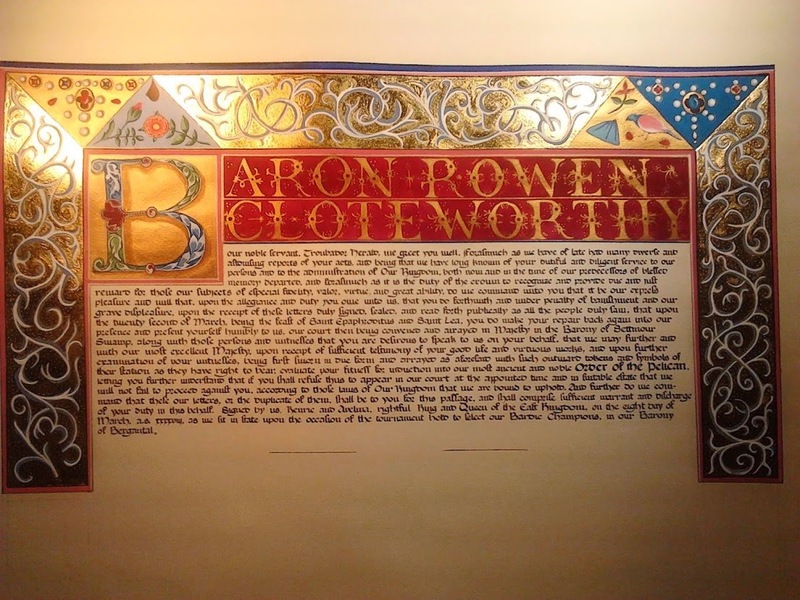 Unto our noble servant, Baron Rowen Cloteworthy, Troubadour Herald, we greet you well. [Abbey and I changed the opening line so the scroll started with "Baron Rowen Cloteworthy" so his name would be called out in large gold letters.] Forasmuch as we have of late had many diverse and astonishing reports of your acts, and being that we have long known of your dutiful and diligent service to our persons and to the administration of Our Kingdom, both now and in the time of our predecessors of blessed memory departed, and forasmuch as it is the duty of the crown to recognize and provide due and just reward for those our subjects of especial fidelity, valor, virtue, and great ability, do we command unto you that it be our express pleasure and will that, upon the allegiance and duty you owe unto us, that you do forthwith and under penalty of banishment and our grave displeasure, upon the receipt of these letters duly signed, sealed, and read forth publically as all the people assembled duly saw, that upon the twenty second of March, being the feast of Saint Epaphroditus and Saint Lea, you do make your repair back again into our presence and present yourself humbly unto us, our court then being convened and arrayed in Majesty in the Barony of Settmour Swamp, along with those persons and witnesses that you are desirous to speak to us on your behalf, that we may further and with our most excellent Majesty, upon receipt of sufficient testimony of your good life and virtuous works, and upon further examination of your witnesses, being first sworn in due form and arrayed as aforesaid with such outward tokens and symbols of their station as they have right to bear, evaluate your fitness for induction into our most ancient and noble ORDER OF THE PELICAN, letting you further understand that if you shall refuse thus to appear in our court at the appointed time and in suitable estate that we will not fail to proceed against you, according to those laws of our Kingdom that we are bound to uphold. And further do we command that these our letters, or the duplicate of them, shall be to you for this passage, and shall comprise sufficient warrant and discharge of your duty in this behalf. Signed by us, Kenric and Avelina, rightful King and Queen of the East Kingdom, on the eight day of March, as we sit in state upon the occasion of the tournament held to select our Bardic Champions, in our Barony of Bergental.